Too busy for breakfast? 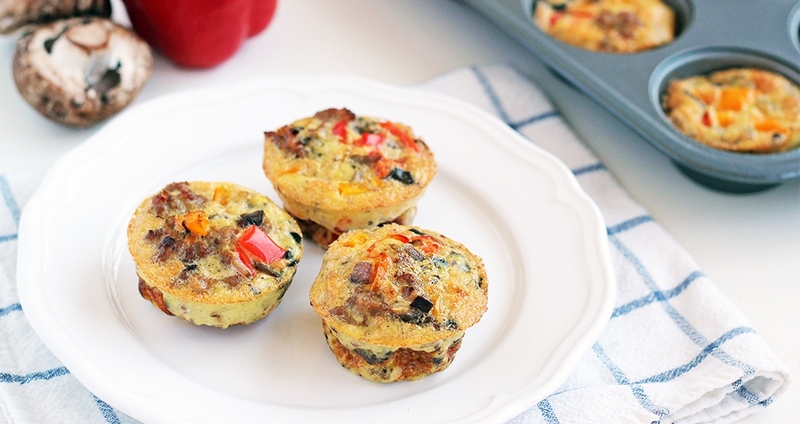 Throw your excuses out the door with these delicious sausage-and-egg muffins! Now you can make your breakfast ahead of time and have it ready to go, as these will last up to five days. Feel free to adapt the vegetables, or leave out the sausage entirely to make these vegetarian. Add one tablespoon of coconut oil to a medium skillet over medium heat. Add the sausage and cook for 5 minutes, breaking up any large chunks and stirring as needed. Add the onions and mushrooms and cook for an additional 3–5 minutes, until veggies are tender and sausage is browned. In a large bowl, whisk the eggs. Add the cooked sausage mixture, bell pepper, salt and pepper. Use the remaining tablespoon of coconut oil to grease a muffin pan. Pour the egg mixture into the muffin tins. Bake for 20 minutes, or until eggs are set. Remove from oven and let cool for 5 minutes. Transfer to a glass storage container and store in the refrigerator until eating.